We write about FPSes each week in Triggernometry, a mixture of tips, esports, design criticism, and a celebration of virtual marksmanship. I’ve had a couple of chances to play Overwatch—when it was first revealed at BlizzCon, and more recently at PAX East. There’s a lot to like about Blizzard’s first crack at a multiplayer FPS: it’s colorful, easy to pick up, and remarkably polished. But one key aspect of Overwatch that’s tough to judge at this stage is how well its spectrum of characters, fun abilities, and weapons will translate to a competitive context. This isn’t a question of balance—it’s a question of whether Overwatch can be many things to many people. One Overwatch’s big influences, Team Fortress 2, had pockets of high-level play, but it never managed to earn wide appeal as an esport or organized competitive game, partly due to its ever-rising pile of items. Then again, the two biggest esports in the world are games with more than 100 characters. But will that approach translate to an FPS, a space where marksmanship and movement can elevate the skill ceiling? I spoke with Jeff Kaplan, game director on Overwatch, to get a better sense of Blizzard’s thinking about these aspects of the game right now. PC Gamer: How do you make maps that accommodate the range of movement abilities currently in Overwatch—high-jumping, jetpacking, teleportation, grappling hooks, and so on—without compromising other aspects of design? 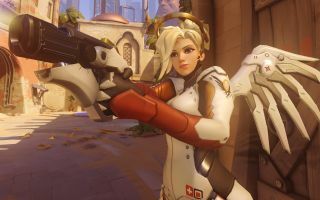 Jeff Kaplan, game director: With our map design it's been pretty interesting because our goal is to actually create the focus on team-based shooter gameplay, and we actually very much want there to be a ‘front’ to the interaction, we don't want it to be like a circular-flow deathmatch, we want there to be a sense of where the attackers are coming from and where the defenders are coming from. So that’s early on, but as we get into it and we start really constructing the space, we go hero by hero. When the map starts to become more fully realized and we always ask ourselves, we call it like the 'Tracer path' or the 'Reaper path.' How is this hero... what route are they gonna take through the map? Where are their advantages gonna be? Are there any cool tricky shortcuts they can take? For example, at Hanamura some of our classes like Tracer or Pharah can just fly across like the back side from the second attacker spawn all the way into the final control point. But we really have to go hero by hero to make sure that everybody is represented and has a powerful moment but also make sure that they're not left hung out to dry. So like Reaper is a good example where early on in that development the maps are usually very hard for the Reaper because there's good areas, there's good mobility areas but he's a tight corridor shot kind of guy, and we have to really go out of our way to create opportunities for him. But that's how we go about it; literally hero by hero. I almost worry that the maps could become too homogeneous in trying to make room for everybody, to give the girl with the jetpack a lane or give the guy with the grappling hook the ledge that they can jump on. How can you reassure me that that won't be the case? Jeff Kaplan: Well, I think even in our existing maps we're trying to take a lot of care in making sure that the maps all play very differently. For example, if you were to compare playing Temple of Anubis to Watchpoint: Gibraltar; Watchpoint: Gibraltar early on has a lot of areas of the map where players can get knocked out, fall to their death. There's some very advantageous flight points for the mobility characters. But then we really find in the whole middle of the map takes place in the interior which the entirety of it is a hangar, and it really focuses the attention—like, the hangar is one of the most difficult places to move the payload through. Whereas in the map Temple of Anubis there's not a lot of heavy flanking that goes outside of the edge of the map, in fact there's very few areas where you can knock anybody outside of the map at all in Temple of Anubis. And you contrast it with another map like King's Row, where the entire middle section in King's Row is actually like a cityscape, and we allow for people to hop over the buildings, and in the buildings the interiors are all capture routes. So it's fun for us as developers to actually explore these spaces, and make things very different, and we know that by doing that it's also going to create a unique experience and the maps won't stagnate because they're just one type. Moving down the road, we've got some really cool stuff planned, the likes of which people haven't seen before yet too, which I'm really excited about too. In another interview you talked about Blizzard’s interest in pursuing Overwatch as an esport. Do you worry at all that maybe its dangerous to build Overwatch as an esport now without waiting for the community to show and demonstrate an interest on its own? Jeff Kaplan: I do think it's dangerous to be overly committed to esport too early in the lifespan of the game. This is something we have a lot of experience with at Blizzard and there's a lot of lessons learned around the studio. From it's very inception StarCraft 2 was targeted to be an esport and I think there was a lot of grief that came out of that, like I think we really did create a healthy competitive esport around it, but at times we sacrificed approachability, not the single-player campaign which I think is actually fantastic; but it's still a little bit daunting for the newer players to get into the multiplayer StarCraft 2, and I think we recognized that. And our most recent game which I think speaks to this is Hearthstone where we really learned a lesson where approachability was first and foremost on our mind with Hearthstone. And it inevitably grew into an esport. I think that Overwatch undoubtedly is going to attract a competitive crowd. What was interesting with Hearthstone is, before it even got out of beta the community was running competitive tournaments for it. You know, no matter what the Hearthstone team wanted, that game was gonna be an esport. And sort of what we see with Overwatch happens is that if you kind of go back and look at the messaging that we tried to put out at Blizzcon, and when we announced the game we focused on letting everyone know that approachability was first and foremost what we cared about, we wanted to make a game that was very welcoming to as many people as possible and not sacrifice that approachability by forcing a competitive esport environment on the game as a whole. With that said, similar to Hearthstone, and we really took our lead from Hearthstone which was approachability first, we watched the community reaction at Blizzcon and how much people have been urging us toward embracing esport. So I think you're gonna see an approach very similar to what we do with Hearthstone where the center of our core is always gonna be that approachability to make the game welcoming to everyone who wants to approach it, but recognizing whether we like it or not this game is going to be turned into an esport. So we would rather turn an eye toward that and embrace it and help guide it in the right way, so it becomes a healthy esport. But honestly right now, the approachability comes first. Will Overwatch have a separate, competitive mode or format? Jeff Kaplan: I think that Overwatch undoubtedly is going to attract a competitive crowd. I think the fact that there's the rich Blizzard history in competitive multiplayer games, I think the FPS genre attracts a very competitive, spirited type of player. And we really want to speak to those players and deliver something that they'll be excited to play and where they can sort of show their level of competition. With that, one of our ultimate inspirations on the Overwatch team is Hearthstone, and we feel like what Hearthstone did was they took a very competitive type of game, you know PvP-only collectable card game, people have been playing it for years, there's a lot of really skilled, highly adept players out there, and they figured out a way to make it approachable for everybody without sacrificing the competitive aspect of the game. And I think we're really studying and looking at Hearthstone for how we want to approach Overwatch in the fact that we want to have competitive modes of the game that speak to competitive players, we wanna embrace that competitive spirit, but we also want to make sure that the game is not just a spectator sport, that it feels very approachable to players who've never even picked up an FPS before, that they would be very welcomed and have a place in the game as well.